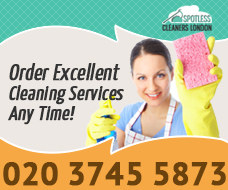 Do you sometimes need cleaning services in London? If so, then we can help you. Hurry up and reserve an appointment at our company if you need to clean your lodgings or home, your carpets, kitchen appliances, upholstery and anything else. We clean, declutter and sanitise. Our crews of cleaners are very hard-working, well-trained and professionally-screened. Not to mention, they are very experienced. We offer a flexible schedule and reasonable costs. If you have too much on your plate and you can’t focus your time and effort on cleaning, leave everything in our skilled hands. We will take care of your cleaning projects. Read more below or call us. We work in London and we are enthusiastic about this service. We have been occupied with cleaning for many years and we have acquired the relevant know-how. Our commercial customers can use our office cleaning services to keep their office buildings sparkling and always in best condition. We offer flexible working hours and we get the job done as quietly as possible, allowing you to work without disruption. Our residential customers have many options. 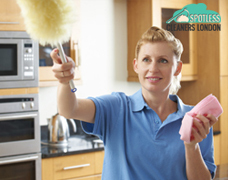 In the first place, they can take advantage of our domestic cleaning services. This is a regular cleaning service, which can be provided weekly, bi-weekly or monthly at your discretion. We offer hoovering, mopping, scrubbing, dishwashing, ironing, decluttering, dusting, laundering, etc. In addition to this we can make your beds and shop for you. If you manage to deal with the domestic chores but you can’t clean your upholstered furniture or carpets, our sofa cleaning and carpet cleaning services are available for you. We use specialised equipment to eliminate dirt, mites, grime and stains both from carpets and upholstery. The products include stain removers, steam cleaning machines and cleaning solutions. Both services are conduced on site. For lodgers and landlords we offer end of tenancy cleaning. Our trained and qualified cleaners do a thorough, from-top-to-bottom cleaning of rented properties before new tenants move in. We clean anything from switches and sockets to countertops, showers and sinks, toilets, kitchen appliances, freezers and refrigerators, floors, knick-knacks, etc. We also offer a guarantee, which is valid 48 hours after we are finished cleaning. You can also order oven cleaning as a separate service. It focuses solely on cleaning ovens, ridding them of baked-on food and debris as well as bad smells. If you plan to give your home a facelift, make sure to use our after builders cleaning services once the renovation is over. We will come and clean your property thoroughly in the blink of an eye so that you can enjoy your home at once. But that’s not all. There are other services as well. Just ask for a complete list over the phone. You can call us anytime because our office staff members are ready to receive your calls 24/7. Our services are available in London and the adjacent areas. If you need any of the above-mentioned services, don’t hesitate to contact us. We will address your enquires with care and attention to detail. Give us a ring.